Representatives from Trinitas Ventures, LLC, made a presentation to the Riverwest Neighborhood Association on Tuesday, January 10 concerning a proposed housing development at 633 E Keefe Ave. The project would cater to students, and would house up to 650 students in a managed, private student housing complex. A number of questions were posed at the meeting, and Trinitas representatives have since sent along answers to those questions. Question: Why were two Trinitas developments sold? Are they still student housing? Trinitas Answer: Both properties were sold due to the economic opportunity to reinvest money into other projects within our portfolio, while allowing our company to continue its growth into other communities. These two sales have allowed our company to grow our business while a majority of the country has had to reduce its employment levels. Trinitas’ ability to get bank financing to grow into other markets can directly be attributed to one sale at the peak of the real estate market in 2006 and 2008. Student housing is a nationally recognized business niche with student operators that specialize in development, construction and management. Our experience when selling these two assets led to two separate buyers and operators that were able to get a bank and investors comfortable with their expertise in the business sector for a successful transaction. The properties continue to be run at high occupancy levels with the targeted resident profile of local university students. Question: What are you doing to ensure the safety of student residents? Trinitas Answer: Additionally, in response to your question regarding educating residents on staying safe, Trinitas will strive to make residents as safe as possible and will utilize all available resources to keep both residents and neighbors safe and free from crime. They would welcome neighborhood residents and the local law enforcement community to work with staff and residents to educate on safe conduct. So, given interest from community members in being a part of the education process, Trinitas would be happy to work together to find the best way possible to educate residents. We Riverwesters like living here. Generally we all agree that we don’t want things to change, and at the same time we agree that things need to change. It’s deciding how things should change that becomes the challenge. Note from RNA regarding Trinitas Development: Attorney Genyne Edwards, who is acting as the liaison between Trinitas and any interested parties in WI, has confirmed that representatives from Trinitas will be attending the Riverwest Neighborhood Association meeting (RNA) on Tuesday 1/10/12 meeting to do a 7-10 minute overview and to entertain questions for another 10-15 minutes. The representatives will also stay after the meeting, in case people want to talk with them privately. |Humboldt Blvd At Locust Street, from 7:00-9:00 pm. Story follows. The south end of Riverwest has been challenged by change through development since the first battles over the Jewel-Osco (now Pick & Save) location on North and Humboldt. Now the north end is buzzing about a proposed student housing complex. Unlike the dorms that straddle both sides of the river on North Avenue, this project is not part of UWM, but will be privately operated by the developers. Trinitas Ventures, LLC of West Lafayette, Indiana presented its plan to a rather small group of residents at Holton Youth Center November 29, 2011. In presenting background about their business, Travis Vencel, Trinitas director of site acquisition, reported successful private student housing operations near Purdue University, University of Illinois, Indiana University, University of Indianapolis and Indiana University-Purdue. When researching where to go next, “Milwaukee consistently came to the top of the list,” as being short of student housing, according to Vencel. UWM has a current enrollment of 26,000 students with about 14 percent in university housing. Trinitas wants to capture some of the remaining non-Milwaukee students who are renting. The housing complex will be located at 633 E. Keefe Ave, between Pierce and Booth Streets. 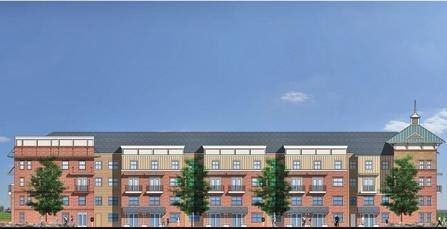 The $35 million development would add about 275 apartments with one, two, three, and four bedrooms renting at $500 to $650 per bed. (Each tenant has his/her own lease and the complex helps match roommates.) That means adding about 650 students to a predominantly owner-occupied neighborhood where many landlords live below the tenants they rent to and manage to keep them quiet. According to a recent report by Marcus & Millichap Real Estate Investment Services, Milwaukee has one of the best apartment markets in the Midwest. Many young professionals are choosing not to buy or do not having access to financing. (See Milwaukee Journal Sentinel report Dec. 3, 2011, “Milwaukee-area vacancy rate among best in Midwest.”) Trinitas does not limit rentals to only students, but targets an 18 to 26 year-old demographic, which could tap into those beyond college as well. Competition may worry some owners of duplexes, but it can also force absentee landlords who are not maintaining properties because they rent to students who don’t care how the place looks to either fix them or sell them. Deteriorating housing stock, as found all over Madison, brings property values down. Trinitas would employ 12 people on-site, including security, and provide shuttle service to UWM, as well as off-street parking. The complex would have a pool, exercise room, café, and internet access. Each bedroom will have its own bath. The old industrial building currently at the site has been only 5 to 10 percent occupied for some years and most likely is not a candidate for light industry, for which the area is zoned. Trinitas proposes to raze the building, do any brown-field clean up needed, and build on the five-acre lot. The narrow end of the four-story complex would face Keefe Avenue. The project would be fully financed privately, taking no public funds. Participants at the community meeting asked what could be done in terms of residential employment and minority business contracting during the construction phase. Barring hurdles, the project could begin in spring and be completed for fall 2012 enrollment. Darryl Johnson, executive director of Riverworks, indicated that agency assisted another private development on the corner of Booth and Townsend, which exceeded established hiring and contracting goals. The agency would give such assistance to the Trinitas project as well. Johnson also indicated that Riverworks is ready to step in and work between the owners and neighborhood should things not go well. Outreach by the two alderpersons representing the neighborhood, Nik Kovac and Milele Coggs, was disappointing. The community meeting was not well attended because notice was not sent and some neighbors are asking for another meeting.